A stele is a vertical stone monument or marker often inscribed with text or with relief carving. 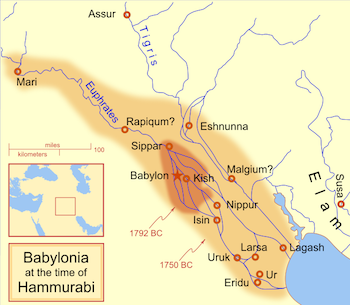 Hammurabi of the city state of Babylon conquered much of northern and western Mesopotamia and by 1776 B.C.E., he is the most far-reaching leader of Mesopotamian history, describing himself as “the king who made the four quarters of the earth obedient.” Documents show Hammurabi was a classic micro-manager, concerned with all aspects of his rule, and this is seen in his famous legal code, which survives in partial copies on this stele in the Louvre and on clay tablets (a stele is a vertical stone monument or marker often inscribed with text or with relief carving). We can also view this as a monument presenting Hammurabi as an exemplary king of justice. 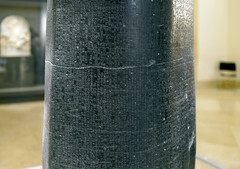 Cite this page as: Dr. Senta German, "Law Code Stele of King Hammurabi," in Smarthistory, August 8, 2015, accessed April 19, 2019, https://smarthistory.org/hammurabi/.